Most people look to escape the cold and snow by going to Florida but we decided to take our winter break in Israel. This was the first time there for all three of us and we were very excited. 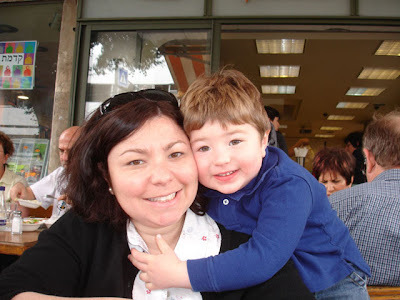 Everyone we spoke to had said that we were crazy going for only one week, but we figured that one week in Israel was better than none. We were happy to escape the bitter cold of New York but we were hoping for better weather than the predicted cool temperatures and rain showers almost every day. High temperatures were forecasted for the low to mid 60's, so going to the beach was not in our plans. 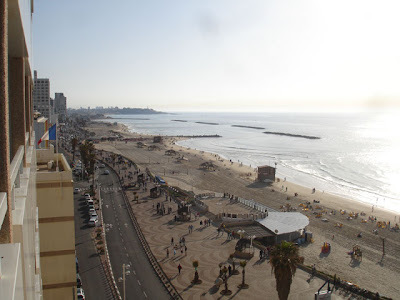 We were going to spend our first day in Tel Aviv followed by 3 days in Jerusalem and then 3 more in Tel Aviv. Israel in 7 days? 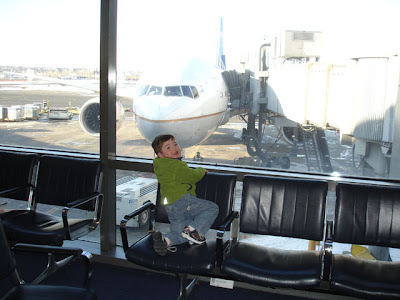 777 is now a permanent part of Elliot's vocabulary and he will tell you that it is his favorite airplane. Just like our Paris trip, the weather forecast was completely wrong! The skies were cloud free, it was very warm and the beaches were busy. 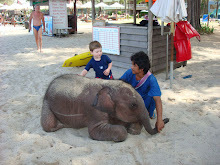 Elliot loves the beach and wanted nothing more than to go dig in the sand. The only problem was that we didn't have swim wear and warm weather clothing. We diverted his attention momentarily with a promise of some food but we knew that wouldn't work for long. 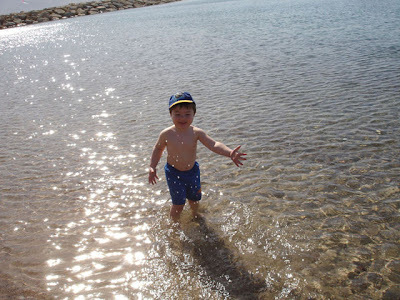 Keith also wanted to swim in the Mediterranean to get in some open water swim practice for the Triathlon so we would need to find some swim wear soon. We spent the first day just walking around and exploring the beach front. The sunset over the Mediterranean was beautiful. It was Saturday so we didn't know what our dining options would be. After walking around we found a great seafood restaurant. Keith has a theory that the more heavily armed the guy at the door is, the better the food would be. At this restaurant (Goo Cha) the security guy at the door had an Uzi hanging around his neck. The food was great so maybe his theory has some merit. 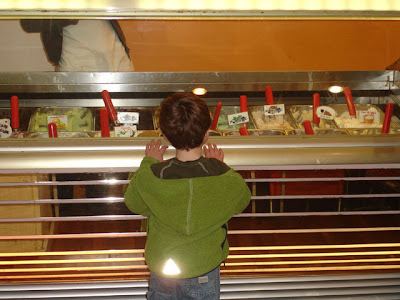 We planned to have a falafel and shawarma taste off but the last thing we expected was a multi city taste off of gelato again. The winner was actually in Eilat and it was so good that we are sure it is owned by Argentineans. 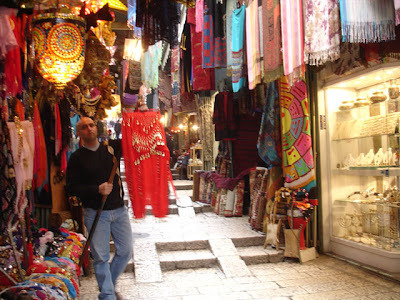 On our second day we took a taxi to Jerusalem and immediately set out to explore the Old City. 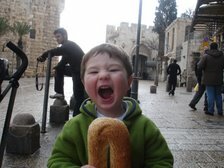 Elliot chomps on his giant bagel outside the Jaffa Gate in Old Jerusalem. These things are Huge! 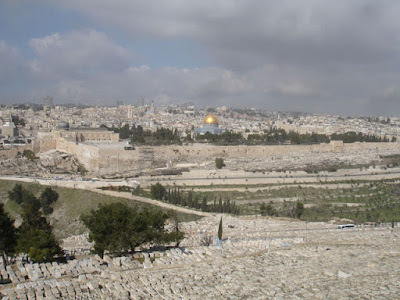 View of the Old City from the Mount of Olives in East Jerusalem. 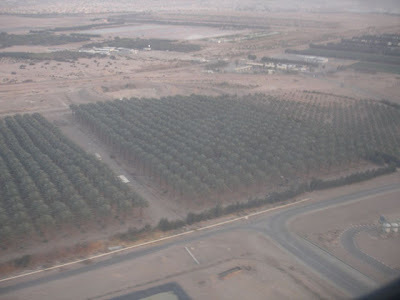 There are no olive trees to be found but at one time it was covered with them. 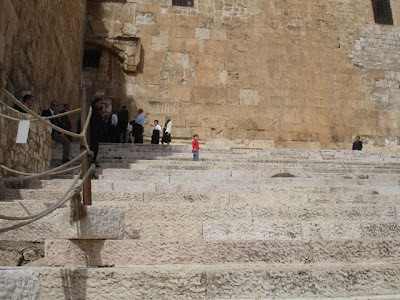 The mountain has religious significance to Jews, Christians and Muslims. 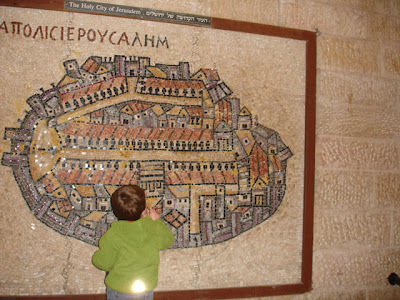 Elliot studies the tile map of the old city. We think he is trying to get back to the bagel vendor again.. 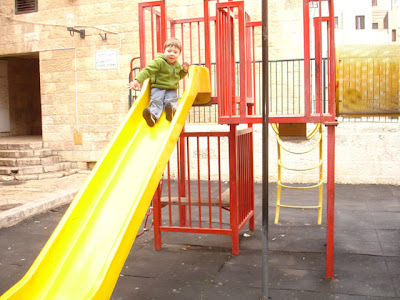 Even in the middle of the old city Elliot is able to find a playground for some fun. 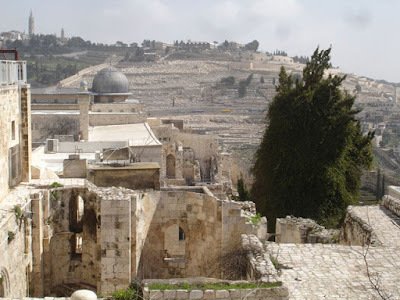 View of the Mount of Olives from inside the Old City. 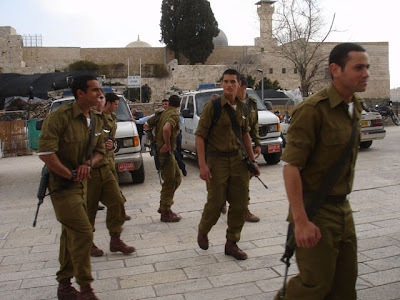 Jerusalem and the old city are full of soldiers. These guys look like they should be hanging out in the mall or working at McDonalds instead of being soldiers. 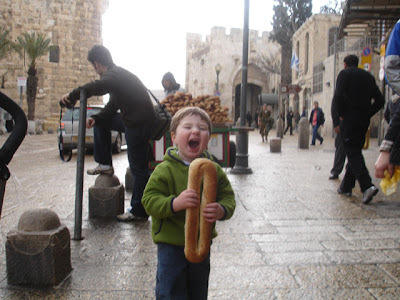 We were lucky to be there in a Monday morning when Bar Mitzvahs are held at the Kotel (Western Wall). 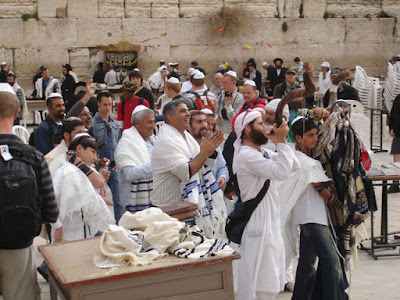 Dozens of Bar Mitzvahs are held here in the morning and every few minutes there is another procession out of the rabbis tunnel, led by music, dancing and the sounds of the shofar. 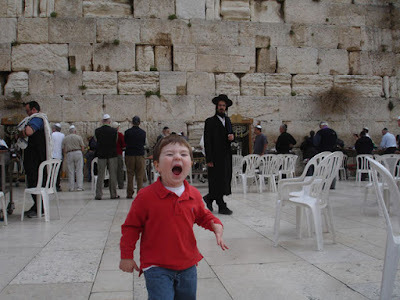 Being that it is a men's only celebration, Corinne had to wait behind the divider, where the women of the bar mitzvah boy's family cheer and pelt him with candy. Elliot sharing in the singing and dancing. 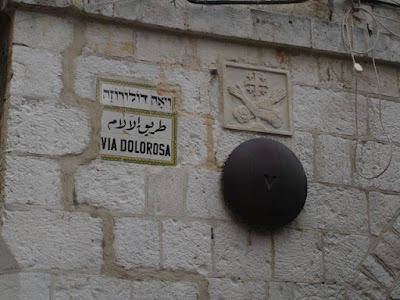 Condoleeza Rice was in Jerusalem at the same time we were there. We suspect that this is part of her entourage or other dignitaries from the US getting a guided tour at the same time we were. Elliot managed to sneak by the security and quickly climbed up the stairs before we could stop him. Notice the 4 secret service guys on the left and one on the far right? 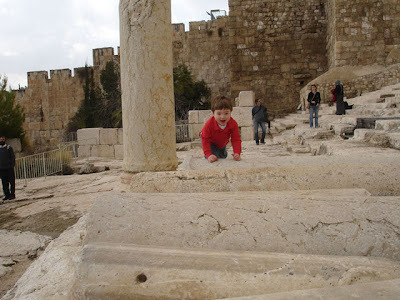 This was taken at the steps leading up to the southern wall of the Temple Mount. ...we found some yummy treats in the Muslim Quarter. This nice gentleman was selling authentic sachlab which is a hot drink made from vanilla orchid, coconuts, cinnamon and topped with nuts. 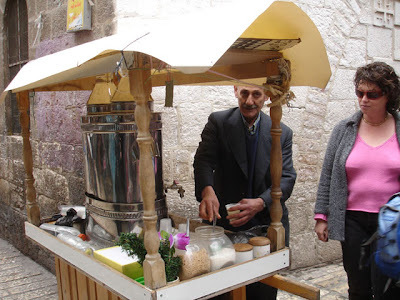 There was also a specialty store that had some of the best hummus that we ever had. Good food has no boundaries. 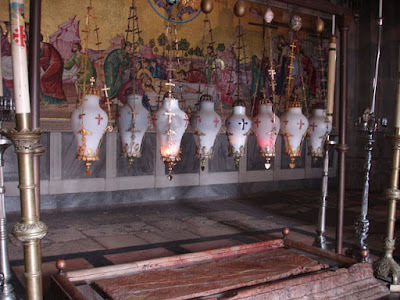 The 13th Station of the Cross inside the Church of the Holy Sepulchre. 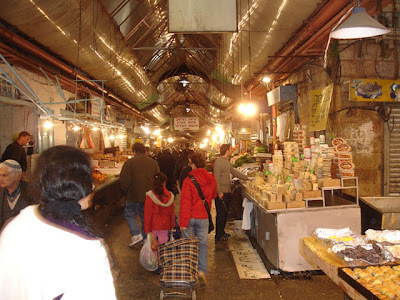 The Arab Shuk in the old city. 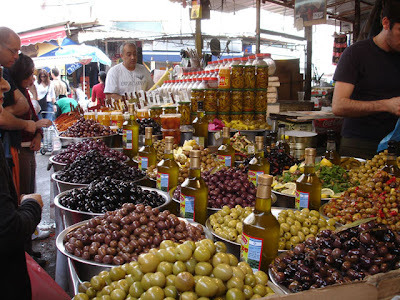 The Shuk is made up of little stores and booths selling a wide variety of food and other goods. Some of the stuff looks pretty nice and, like many tourist areas, there is a lot of "made in China" junk. The vendors are a little aggressive and can really lay on the pressure if you don't visit their stalls. Elliot ended up with a singing stuffed camel. 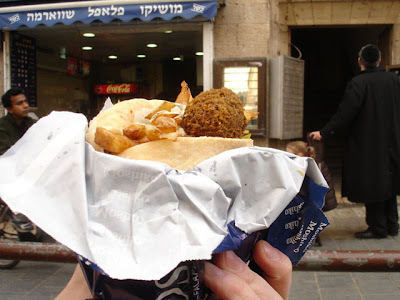 Falafel is to Israel as pizza and hot dogs are to New York. 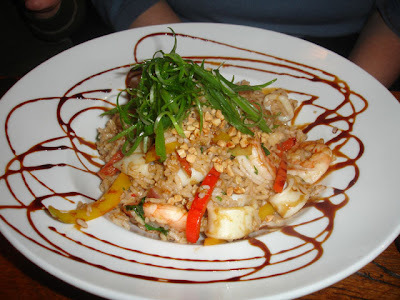 As usual we did a thorough evaluation, searching out the best, but our conclusion was that they were all great. A big plus for eating on the go is the french fries in the sandwich. Brilliant!!! 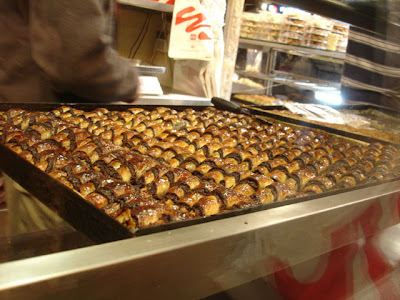 At the Mahane Yehuda Market we had Chocolate Rugelach fresh from the oven. Not sure how they can be any better than this. A+. 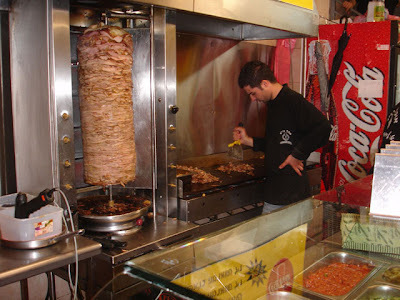 Shwarma time! Notice the circular saw on the left side. Maybe I'm crazy but I think that I saw it on an infomercial once... The Ginsu 2000 with free Sharma cutter if you act NOW!. 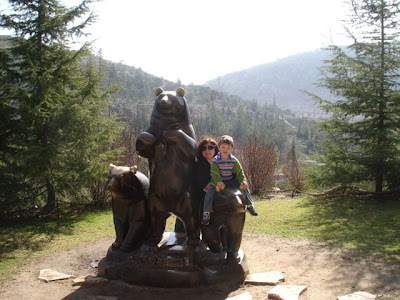 The Jerusalem Zoo in its new location opened in 1993 and has great habitats for all of the animals. 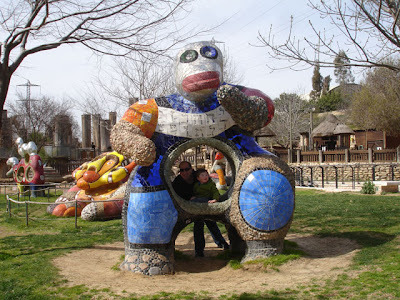 The kids zoo is fantastic and we had to pry Elliot away. It was largely funded by the same family that funded the Central Park Zoo in New York. The weather kept getting warmer each day with temperatures by the week end to be around 85F. Just for kicks we checked on the Internet for some flights and hotels in Eilat and within a few minutes we had the trip booked. It would cut out a half day from Jerusalem and a full day from Tel Aviv itineraries but it sounded like fun. Corinne and I both have the same memory from Hebrew School where we were asked to help plant trees in Israel in honor or memory of someone. You never really know how the money gets spent or if the trees get planted but I always imagined seedlings being planted in some new forest. Maybe they would even have a little tag that said "In honor of..." as we put down on the form. On our flight to Eilat I spotted what might really be that forest. I may never know for sure but maybe my trees are down there with those little tags after all. 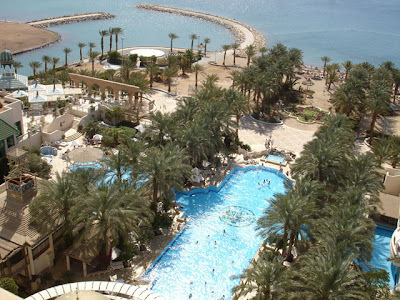 The Eilat airport is right in the middle of town and is surrounded by huge hotels and theme parks. It felt like we were landing on the Las Vegas Strip. The Taxi ride was only 3 minutes to the hotel. When we checked into the hotel, the desk agent poked around on the computer for a few minutes, became stressed out and said that we would have to sit down in the lobby and wait for the manager. We were expecting the worst and thought for sure that we were on our way to another hotel (or worse) but after a 20 minute wait, the manager came over, apologized and gave us the keys to a very large a top floor room. 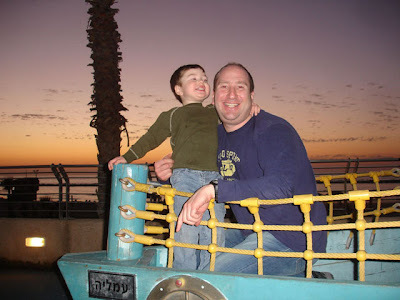 Eilat was fabulous and we really enjoyed the town and pool/beach. 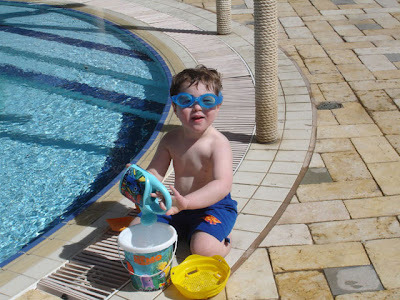 No scuba diving on this trip since Elliot won't be certified for another 9 years!!! As you can see he loves the water already. 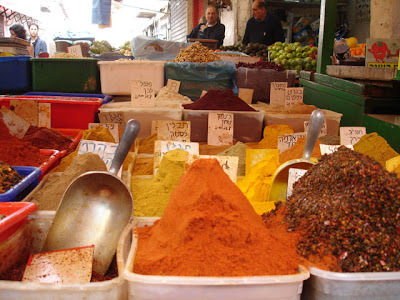 On our last full day in Israel we began our day at the Nahalat Binyamin and Carmel Markets. 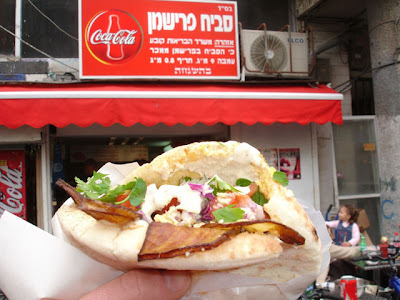 We read on the Internet about the Sabikh (aka Iraqi Sandwich) which is made of fried eggplant strips, hard boiled eggs, hummus, tahini and vegetables. It eluded us until the very very last day because none of us could read the Hebrew signs so we didn't know we were ordering one. We just saw a huge line out the door at this take out stand and said that something good must be in there and we were right. 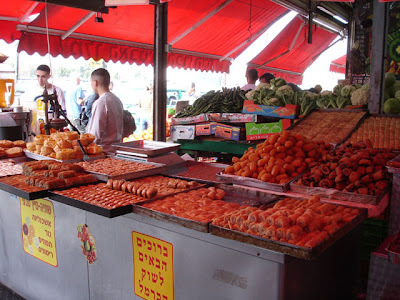 We later found out that this stand is regarded as having the best in Tel Aviv. Well, we had a fantastic time. Reflecting on our trip, the amount that we experienced was vastly overshadowed by what we did not. We will definitely return soon.